BonBon's Guide Service provides year-round fishing for Walleye, Muskie, Northern, Bass, and the occasional Crappie and Lake Trout. BonBon’s Guide Service specializes in customizing your fishing experience to ensure you have an amazing fishing experience. Whether you’re a family with young children looking to inspire a love of fishing, or an experienced angler looking for “the big one” BonBon’s Guide Service will work to accommodate your unique fishing needs. 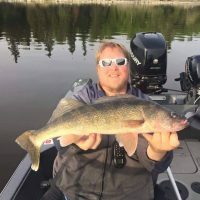 Scott (Bon Bon) Baumgartner has been a licensed boat captain offering amazing guided fishing trips since 2012, but has been fishing Lake of the Woods since he was a child. Bon Bon grew up in Roseau, MN and is an avid outdoorsman and conservationist with much local knowledge of the lake and geography of the area. He especially enjoys sharing his passion for fishing, and his local knowledge with others, and he provides an extremely positive experience for both experiened fishermen and those who are new to fishing. He takes great pride in ensuring that each client has the necessary tools and support to have a wonderful experience, and his repeat clients are a testament to his committment to making fishing accessible, positive and environmentally responsible. Bon Bon is a certified machinist, holds a first aid certificate, and splits his time between Kenora, Ontario and the North West Angle.